The Heavenly and Earthly Scenes are the foundation to understanding. The Matthew, Mark and Luke verses add to the foundation. Now, Related Scriptures are added. Time Zone A marks the Church age leading to the time Zone of Wars and Rumors of Wars/False Christ's/End is Not Yet/Don't be Deceived. Time Zone B is when Wars and Rumors of Wars, Don't be Deceived etc. takes place. Peace and Safety (the days of Noah) then sudden destruction (like the flood demonstrated). For the Overcoming Believers, The Day won't surprise as a thief. 2 Thessalonians 2:3-4 is so important!!! Don't be deceived in this Time Zone, just like we are told in Time Zone B. When God tells us, "don't be deceived," it means we can be and many will be. There will be a great falling away first...(before the Catching-Up or Rapture) which again, is why we are warned to not be deceived. The World will mock Christians saying, "Where is the promise of His coming?" Why would the World do this? Because the Church 'promised' His coming at the wrong time. Read Imminence... Satan's FALSE Message? What about Daniel 2? At the end of this Time Zone C, and beginning Time Zone D, is the Catching-Up or Rapture. 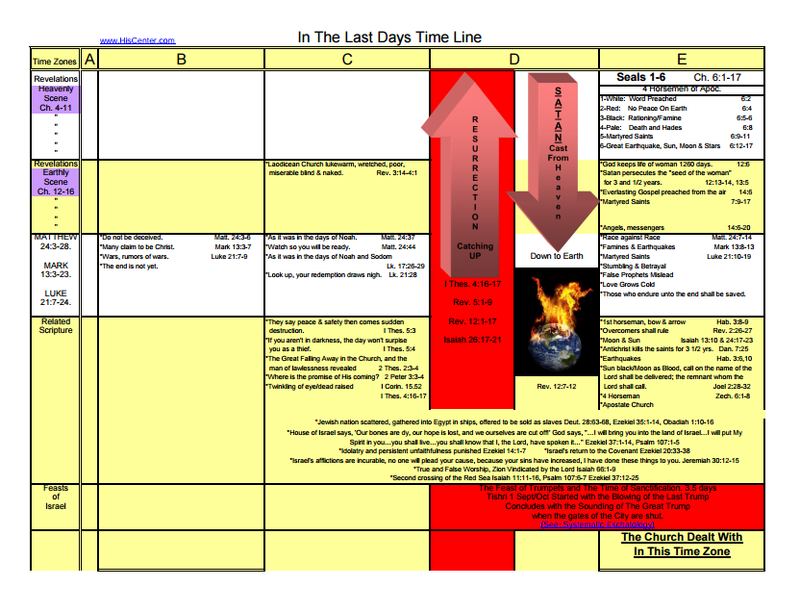 Time Zone C turns into D at the moment of the Resurrection/Rapture (Catching Up). 1 Thessalonians 4:16-17 For the Lord Himself will descend...to the clouds... with the Trump of God, for the Dead in Christ rise first, then the Rapture/Catching Up for the Overcomers. Revelation 5:1-9 Only Christ is worthy to take the End Time Scroll from the Father. Before opening the Seals, a multitude of Believers/Overcomers from all of the world, are already in Heaven. "...thou hast redeamed US..." This shows the Rapture occuring BEFORE the Tribulation begins. When Satan is cast out of Heaven, he knoweth he hath but a short time, vs 12. Short Time: Satan is given 3 1/2 years to persecute the woman and her seed, Rev. 12:6. After the time of Christ's earthly life, the Church has been persecuted for much longer than a short time, 3 1/2 years. Because of this, the woman and man child (her seed) can not be referring to Jesus' birth, as is popularly taught. Verse 17: And the dragon was wroth with the woman, and went to make war with the remnant of her seed, which keep the commandments of God, and have the testimony of Jesus Christ. Satan persecutes both the woman (the remaining Church organization after the Rapture) and the remnant of her seed (believers who were not ready Matthew 24:44, and those who get saved after the rapture). Revelation 12:5 & 17 identify both the man child, vs 5, and the remnant of her seed, vs 17, as referring to Believers, near the time of the end. Therefore, the birth of the man child must be taken as a picture of the Rapture before the Tribulation. When the Jewish Nation is under this captivity, they will give up all hope and fear their extinction Ezekial 37:1-11. The Jewish Nation is brought back to the bond of the covenant in the Wilderness outside of their land Ezekial 20:33-38. After this gathering takes place, God will miraculously bring the Jewish Nation into the promised land, which is contrary to the popular teaching that believes the Deut. vss have been fulfilled. THE ISSUE as to why the Deut. vss have not been fulfilled is because of the Isaiah vss that follow the Deut. vss telling us HOW the Jewish Nation will be brought into the Promised Land out of Egypt...by God, not man. This has NOT happened yet! Time Zone E vss align with the Heavenly/Earthly Scenes; and Matthew, Mark and Luke. Time Zone F vss align with the Heavenly/Earthly Scenes. Time Zone G vss align with the Heavenly/Earthly Scenes; and Matthew, Mark and Luke. Time Zone H vss align with Revelation vss. Click The Image Below to Download This Portion of The Chart as the chart gets bigger, printing it will help.